I found Frank scuttering around in his digger churning up the sticky clay-laden mud. Picking my way through the furrows on my way to the site office, I had to swiftly dart for cover along with his hens and three cockerels as apparently he stops for no man, woman or chicken. I was dressed in a military-style jacket and beret, and looked very much like I had parachuted down into occupied France to inspect the trenches leaving my parachute dangling from a nearby tree. I didn’t actually parachute in but I was indeed there to inspect his trenches and was probably camouflaged on this grey day threatening even more rain. Rain was not something Frank needed now. Three weeks ago he started digging having demolished his house. 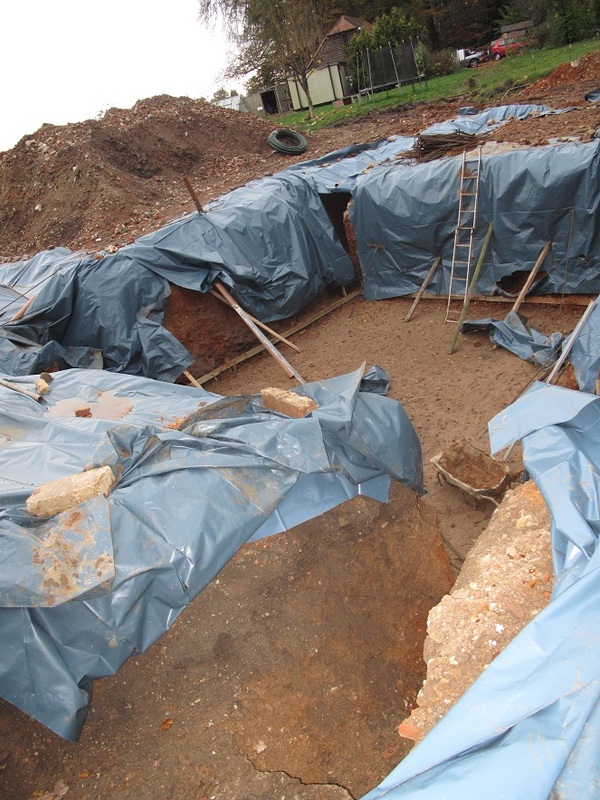 The trenches for the footings of his new house are almost finished and he has excavated a cavernous area which will serve as his basement. The rain is his enemy. Swathes of blue plastic weighted down with flints cover the site but he tells me that as soon as he has finished his beautifully dug trench, the water caves it in again. I would be pulling my hair out, Frank is still smiling. He is going to build the house himself. The whole thing. He has the architect’s plans and the structural engineer’s drawings as well as two excellent labourers. I would be worried if anyone else was taking on a project like this, but Frank is someone who can do anything if he puts his inventive mind to it and I’m looking forward to seeing his house emerge from this Somme-like squelchiness. It being winter, as more rain is forecast to fall this evening and the light will soon fade, I am loathe to take him away from his shoring up duties. But luckily for me there is a tea break on the horizon and a window of opportunity to ask him some questions. The site office is a deluxe model; modified by Frank himself from a building that looks like a very small version of one I did maths lessons in at school – a terrapin as it was called in those days. It has a microwave, tea making facilities and what looks like an Ikea billy bookcase with its shelves festooned with sweets and chocolates. He also has a flat screen TV for those days when the weather defeats him. Next door is a toilet with an ingenious waste system that mashes whatever needs mashing and flows down a pipe to the existing drain. As the chaps drink their tea they proudly show me the microwave operation functions which include the facility to cook a whole chicken. They are weighing up whether to have a go. ‘Well’, I say ‘there are plenty outside’, (do the cockerels first I say to myself). When did you start the build? 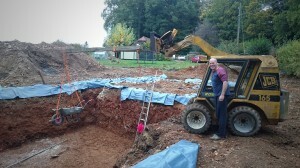 We started digging the foundations about three weeks ago. And when is your estimated finish date? It will be as and when because I want to do things right and don’t want to bodge it. 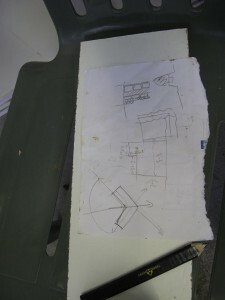 Frank draws me a diagram of the structure of the half metre thick walls he is building, which will be covered with flint held in place with metal ties. He reckons he could affix 1 square metre of flint-work per day, and there are 62 square metres to be done. Definitely a job for some nice sunny days. He has taken his inspiration for the look of his house from Bradfield College in Berkshire (how very posh). Are you doing everything yourself even the electrics? Yeah, why not – it’s easy. How will that work with certificates, building regulations and suchlike? I don’t know yet but I will find out. Also, because it’s an eco-build, we have to do things in a certain way and log everything down as we are doing it. I’m not sure how that works yet either, but I have been told that at the end we have to get an eco sign-off. There is a points system. We have hot and cold running water in the cabin and a light sensor, which gives us two points apparently – I have no idea who is collecting the points, but I just go on collecting them. Me – but I had an architect who turned it into a nice looking house. He did the drawings and took care of the paperwork and bureaucracy. We also had a planning agent recommended by the architect to get us through the red tape. We wanted an increase in height and volume, the house is in an Area of Outstanding Natural Beauty (AONB), has heritage overlay (HO), is in ancient woodland and is also in an area of historical interest. (I hope he finds an ancient hoard of gold!). Was it expensive to get a planning agent? No, she only charged us about £300 in total – it was most definitely worth it to get our planning application through. So really the only difficulty now is the weather isn’t it? At first I didn’t understand why a lot of people I spoke to about the build said that I was brave starting it in the autumn – now I do! That is your very own digger outside isn’t it? Yes, it was a good investment; I use it all the time to move things around the site and for lifting. I can’t recommend it enough – it’s paying for itself. Tell me about the wheelbarrow contraption I saw in your trench. Well, we have no crane onsite and we have a 3 metre deep hole in the ground. The contraption is a wheelbarrow strapped to a wooden lever, which is then strapped to the arm of the digger to lift heavy things up out of the trench – it can take about 200kg in weight. (See photo). What effect has this build had on your family? (A cockerel crows loudly outside). Life just goes on as normal really. People are saying that I’m too enthusiastic about everything – like when I find a new clump of mud for instance. They say ‘you’re getting excited about more mud!’ And I say ‘well, I’m just thinking about where I can put it or what I can use it for’. They just think it’s a load of mud but I see it as something I can fill a hole with. Do they muck in and help out? No, they just let me get on with it – just another one of Frank’s projects. When it comes to the finishing and decorating I can guarantee they will help because I will be out of my depth. I can build a room, I can give them bare plaster and skirting boards but I have no idea how to finish it. I told Frank how happy Mr Clark was when he managed to get hold of a nail gun to put our skirting boards on. Frank’s said ‘if there are any tools that will save you time – buy them’. Poor Mr Clark had to make do with borrowing the carpenter’s one. I wouldn’t have been in the budget you see, however much he wanted one of his own. The tools I buy are saving me money in the long-run as I don’t have labour costs to consider, and I can always sell them again at the end of the build. Time is money. I don’t have any income at the moment, and as I have shut my business down we’re living off savings, so my labourers are on a day rate and luckily they are very flexible. I want to get on with it – the only things that hold me back are when I’m waiting for a contractor to come along to do a job, or a there is a delay with a materials delivery or bad weather. We need 100 cubic metres of concrete for the footings which will cost about £10,000. When the trenches are full of concrete we have to put the blocks in exactly the right spot and, (he says laughing) I haven’t figured how to do that yet. He has a laser level but reckons string and tape measures and more string are the answer. (I have every faith that he is right). Frank’s house has been designed to track the azimuth of the sun from solstice to solstice. This means that the building will get equal amounts of sunlight all year round – this also means some of his walls won’t actually be square and parallel, they will be at an angle of 102 degrees which makes the building of it even trickier. What sort of heating are you having? Ground source heating – I’ll be putting the coils in the outer walls of the trenches all the way around. The trenches are deep, but that is because I wanted to build on solid clay. I’ve got 500 metres of coils to put in. Frank then climbed down into his cavernous clay basement, and I thought this would be the moment to leave him and his labourers to it. ‘I’ll be back’ I said waving and stomping my way off through the mud. And so I will (with a spare ball of string in my pocket). Watch out for the next instalment. Hopefully the rain will stop and Frank will have had his big concrete pour. I hope he will still be smiling. Thank you Mr D, see you soon! This entry was posted in Building tips, Interviews, Self-Build, Site management, subcontractors, Top tips, Uncategorised and tagged AONB, architect, azimuth of the sun. solstice, chicken, chocolate, cockerel, concrete, Digger, eco, eco-build, flint, ground source heating, labourers, laser level, microwave, nail gun, planning agent, plaster, rain, Site office, skirting boards, solstice house, string, structural engineer, sunlight, tea break, the weather, top tips, trenches, wheelbarrow on 24th January 2016 by Mandy Clark.